Remy International is a fast-paced environment where employees provide best-in-class service to customers across the globe. They needed a solution to unify HR and create a common repository for global employee data. Remy International traces its roots to 1896, when brothers Frank and Perry Remy developed the Remy Magneto to power the first vehicles. Today, Remy is the leading global manufacturer and remanufacturer of automotive parts such as starters, alternators, and hybrid motors. They are based in Indiana and have global operations across four continents and 11 countries. We Start the World & Keep It Running™ is not just a tagline but a company goal – long-standing partnerships allow Remy to stay ahead of customer needs and develop more innovative products and services within the automotive industry. Remy International is a fast-paced environment where employees provide best-in-class service and communications to customers across the globe. They needed a solution to unify internal HR processes and create a common repository for global employee data. The country-specific HR solutions yielded fragmented and incomplete information. Initially, PeopleSoft was chosen as the solution to meet these needs. Budget constraints and the need for too many customizations made a global implementation of PeopleSoft virtually impossible. After several attempts to implement PeopleSoft successfully, Remy looked elsewhere for a more innovative solution to unify the worker population. In Workday’s SaaS model, Remy found the configuration methods to be better suited to its dynamic global needs. We worked with Remy’s team to deploy various Workday functionalities in multiple phases including Workday Core HCM, Absence, Benefits, Compensation, Payroll, Performance, and Integration Development. The initial implementation phase included the US, Mexico, Canada, Brazil, and Hungary. Subsequent phased implementations included Tunisia, UK, Korea and China. 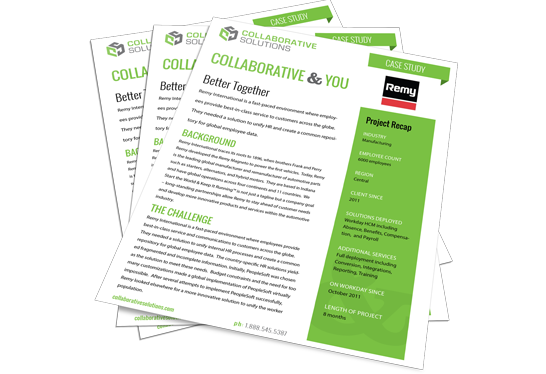 In addition to hitting their goals and streamlining global data, Remy has benefitted from unintended results such as quicker, easier upgrades and the ability to add-on additional functionality in a more efficient, streamlined manner than previously experienced with PeopleSoft.